Halloumi is without a doubt the best cheese for the BBQ, keeping a firm consistency as it cooks, and soaking up the marinade flavours. Soak bamboo skewers in water for at least half an hour before use. Cut the block of halloumi into 12 equal pieces. Cut each of the peppers into 12 large pieces, and slice each courgette into six thick rings. Clean and trim the mushrooms. 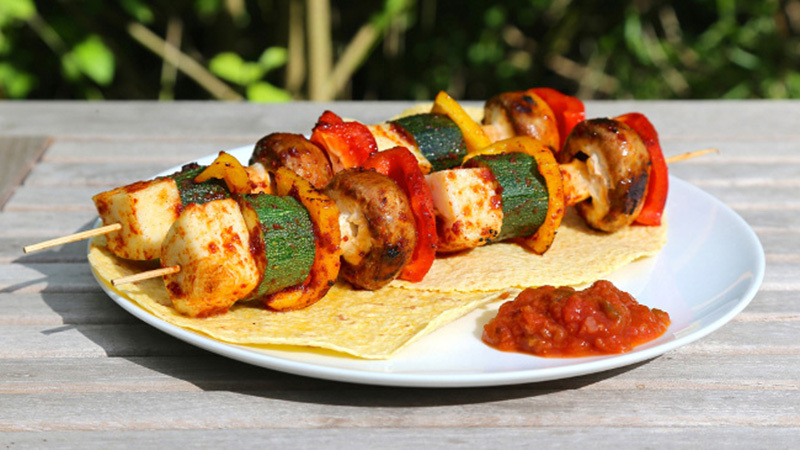 Thread the vegetables and halloumi onto the skewers: you should have enough space for two of each ingredient on each skewer. Baste the skewers liberally with the fajita spice marinade. Cook over a hot BBQ for 5-10 minutes, turning regularly, until the vegetables are cooked and beginning to char. Dab on extra marinade during cooking, as required (if you start to run out, you can add more oil). Serve with corn tortillas and a generous scoop of salsa on the side.